Larry Puzen called the meeting to order at 6:31 pm at the PACE office. Those attending were Larry Puzen, Rock and Pam Mannigel, Steven Karcz, Larry Szymanski, Katie Walters, Mike Blohowiak, Claudia Ryczkowski, John Mihalko, Chris Jaworski, Tammy Brzeczkowski, Steve Peplinski, Roger Brzeczkowski and Norine Heuser. Secretary’s Report – Mike motioned to accept the report. Roger seconded. Motion carried. Treasurer’s Report – Larry reported the checkbook balance is $23,386.06. We have taken out 2 CD’s to have money readily available for repair of the back of the museum and parking area. Rock motioned to accept the report. Steve Peplinski seconded. Motion carried. Larry mentioned Damon Szymanski would like the hitching post he offered us moved by October 1st. After discussion, it will be placed near the sign by the sidewalk of the museum. Claudia asked him to write a short history of the stone. Larry also read a thank you card we received from the Road Rally thanking us for participating. The Green Bay Antiquarian Society asked if we would like to buy another ad in their program for the upcoming Antique Show. After discussion, Steve Peplinski made a motion to go with a $50.00 ad like we did last year. Roger seconded. Motion carried. 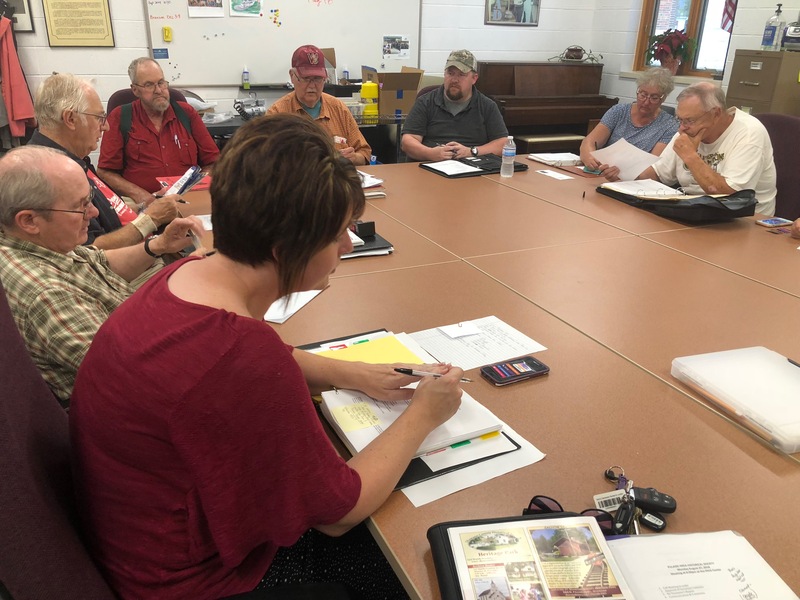 Shawano County Fair – Tammy said it went “fair”ly good… ☺ She displayed pictures and artifacts that pertained to the fair’s theme of agriculture. Newsletter – Chris is working on an article regarding the Pittsfield Town Hall. The town decided to build a new one by the community park in Anston to be completed by September of 2019. The decision of what to do with the old one has not been made. Claudia said she has something for the newsletter too and will get it to Tammy & Chris. School Volunteers – Rock said they have 11 students on the list but all are very active in extracurricular activities so they usually have 4 or 5 that show up. They decided that Mondays from 3:00 – 5:00pm work best for them. Steve Peplinski has been teaching them how to do the computer work with the Past Perfect tutorials and he now has two stations set up for entering data. They are working on a big project of organizing photos and have increased our obituary volumes from seven to eleven. Museum Hours – They will be Mondays from 3:00 – 5:00 and Wednesdays from 2:00 – 5:00 based on availability of volunteers. As always, by appointment as well. Katie told us there will be four volunteers from Premier Bank who are available for whatever we would like done at the museum as part of their “Make a Difference Day” on Columbus Day October 8th. It was decided we will have them clean our display cases so they are presentable for our annual dinner. Other projects can be done as time allows. Larry Puzen received an estimate from Tri City Glass & Door for an aluminum door for the back of the museum for $2,640.00 or a steel door for $1,950.00. These prices do not include labor so he is looking into that next. Mike said we should have a small window in the door. Claudia reminded the board that proper protocol needs to be followed when anything is taken out and/or returned to the museum. Annual Dinner – Norine will let everyone know when the hall will be available for setup when she hears back from Don Murdzek. The speaker will be David Siegel. Chris will check with Fischers regarding the work they have done on the home place for the preservation award. It was decided we will once again have a Pie Auction thanks to Tammy agreeing to run it again. Tammy said Maria Deau has offered to serve on the board of directors so Norine will include her on the ballot. Pam once again graciously agreed to run the 50/50 Raffle for us. Rock said they have received a carousel of about 80 35mm slides from Mary Holewinski showing the history of the White Elevator. He was wondering if they should put them on a DVD so people can see them. Camera Corner could do it for about $96.00. Claudia said we need to first print out photos to see the clarity of them and decide on the size of photos for the DVD. Chris made a motion to go ahead with this project. Katie seconded. Motion carried. Tammy made a motion to adjourn. Steven Karcz seconded. Motion carried. Meeting adjourned at 7:53 pm. Our next meeting will be the annual dinner on October 24, 2018. Minutes taken by Norine Heuser, recording secretary.